Ever since I started using a cell phone as an alarm clock I’ve enjoyed not having a clock on my nightstand. I used to wake up incessantly every half-hour or so and check the time. Now, I usually just wake up once in the night, and often don’t care what time it is. Unless there’s that sinking feeling that it just might be only fifteen minutes before I have to get up and then there’s no point at all in going back to sleep because fifteen minutes is barely enough time to slow your breathing down let alone achieve REM stage and just look at the clock and see what time it is already!! So. 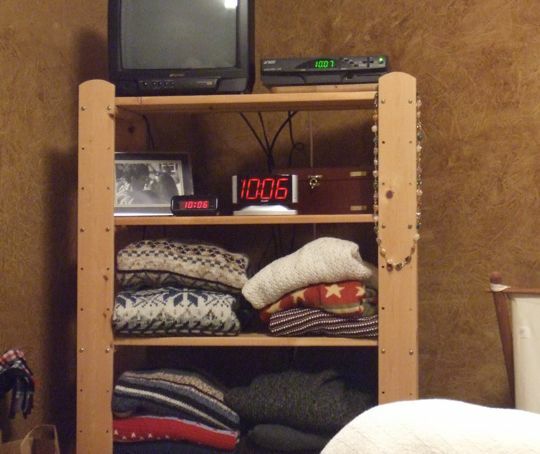 We have compromised and put a clock way across the room so Lloyd can check the time. The problem is that I’m as blind as a bat and no amount of eyelid-pulling lets me see those numbers. (You nearsighted people know what I’m talking about.) I can check my cell phone, but that’s the equivalent of shining a flashlight in your eyes, and is not very restful. And so we come to the boring conclusion of this post: I bought a clock with bigger numbers. I’ll let you know how it worked out. I know you’re dying to find out. Is there such thing as a Braille clock? Maybe you could just keep that under your pillow. Mollum makes me type the check-code thingy every time I comment. As a public service announcment, I wanted to share that the code is not case sensitive. I’ve spent many-a moment wondering if that was a capital C or lower-case c. It doesn’t matter. Thank for the service announcement. I hate Mollom. He harasses me everytime. Me too…under my work email address…so I changed it to my home email & it hasn’t asked me since. I’m sorry about that. I’ll get my tech guy to see if he can change it back. Maybe the bouts of evil spam are over. I have the same alarm clock -- the smaller one that is. When my eye sight goes bad, I’ll get your input on the bigger version. Sis, I had to do the same thing. The next step is a one of those clocks projecting numbers on the ceiling or wall that are four feet tall. I LOVE waking up & it being like 2 or 3 am….ahhhh, plenty of time…it’s like Christmas in the middle of the night. My alarm is right next to me so I can hit the snooze. Sometimes I hit it 4 times before I get up. I hate getting up.